This visual effects shot involves the A.P.C. inside the Atmosphere Processor station, scenes 103 - 105, p54 of the final draft script. This sequence was shot on "M" stage by Leslie Dear (lighting cameraman), Michael Anderson (camera operator) plus others. 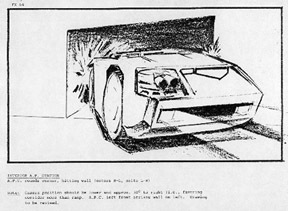 Extracts of the text are taken from an article by Adam Pirani that appeared in Starlog #106. Pinewood Studios: M Stage. FX make a significant contribution to the ALIENS storyline. 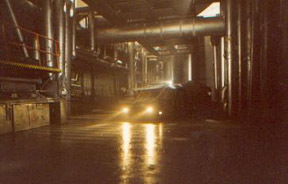 While the main unit shoots elsewhere, lensing continues on two stages being used exclusively for visual FX by the LA Effects Group, which also worked on Commando and Jewel of the Nile. Filled with thick, grey, fog-like smoke, M stage's visibility is only about 10 feet, but muted lights beyond suggest that the small stage extends into infinity. 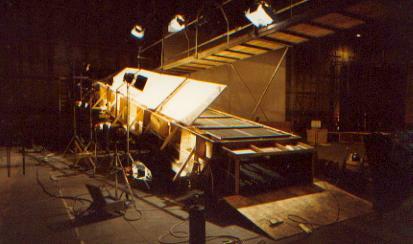 Attention among the FX crew is focused on a miniature set built on a ramp. 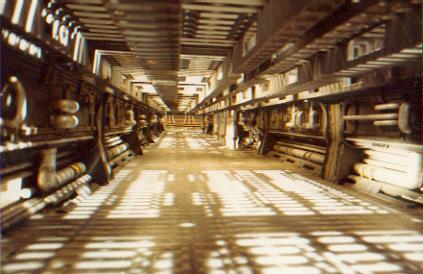 The set is the floor, walls and ceiling of a lengthy corridor within the atmosphere processing station. Approximately 18 inches high, four feet wide and 25 feet long, the corridor structure is built from wood. The ramp that it rests on is at a 30-degree angle to the floor, itself supported by sturdy scaffolding. At its highest point, the ramp is about 15 feet above the floor; at its lowest, it touches the ground. Looking up through the corridor from floor level, the utility of the acrid fog is apparent. Suffused with smoke, the meticulously detailed corridor interior seems to have no dimension; atmospheric lighting gives the impression it could be any size. The camera operator is preparing for the next shot. 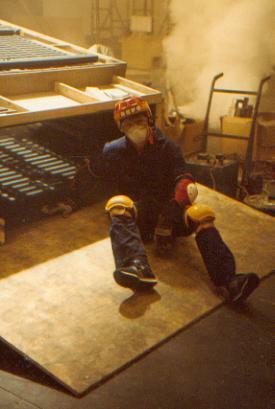 He wears a track suit, light crash helmet, knee pads and elbow pads. 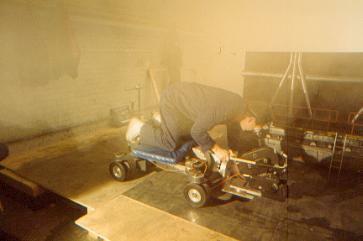 The camera is fixed on the front of a six-foot-long, skateboard-like "dolly" mounted on trolley wheels. For this shot, the camera operator will lie down on the foam-covered dolly, which will be released inside the 18-inch-high corridor, from the top of the 25 foot long angled ramp. The wheels are locked off so the dolly can only travel in a straight line. But when it reaches the bottom, the dolly will have considerable velocity. Four or five crew members are standing just past the ramp's bottom to catch the dolly - and the operator. What the camera will actually be filming is a miniature APC, an Amoured Personnel Carrier used by the Colonial Marines. It is a one-twelfth scale model of an APC which was used at the Acton location. With gigantic wheels and thick amour plating, the full sized version was adapted from a vehicle used to tow jumbo jets along runways. The FX crew is ready. The camera is set to film at 48 frames-per-second, double the normal, to achieve the best looking speed. Form the inside of the top of the ramp, the dolly is released, and a moment later, so is the miniature APC. Now, as he lies face down on the dolly, which is rolling backwards and accelerating very fast, the operator, looking through the camera eyepiece, must keep the weaving APC in shot and in focus. There is a sudden crashing noise, several expletives, and the operator on his dolly rockets out of the ramp's bottom and is caught and brought to a halt. It takes only a few moments to discover that the operator is all right. He explains what happened-the miniature APC hit the camera lens. It must have been released to soon. It takes only a few moments to check that neither piece --- the hand-crafted model nor the expensive camera - is damaged, but it will take more time to prepare the shot again. Despite these occasional delays, LA Effects line producer Suzanne Benson is pleased with her group's progress on the movie so far. "This is a very complex project," she notes. "We're doing about 150 special photographic effects shots, and I think, for the projects size, it's going extremely well." In doing miniature FX, optical work and motion control shots, retakes and problems are inevitable, she says. "Sometimes, you can't help it."